The shift for greater attention in critically assessing the impact of peer supportive treatments on psychiatric and associated symptoms in addition to substance use within addiction research is crucial as psychiatric symptoms are highly prevalent within this population and may impact outcome. This is even more important during the initial phases of treatment due to withdrawal often including an increase in psychiatric symptoms and associated high risk for relapse. We received National Institute on Drug Abuse (NIDA) funding to conduct a Stage Ib (initial randomized controlled piloting of a new intervention) study to evaluate the efficacy of mentorship for Addiction Problems (MAP). MAP is a novel behavioral intervention that formalizes client-to-client mentorship relationships as an adjunct to Treatment as Usual (TAU). Sixty-five participants (17 Later Recovery Participants/LRP eligible as mentors and 48 Early Recovery Participants/ERP eligible as Mentees) with substance use disorders, including alcohol, cannabis, opioid, and cocaine, were randomized to MAP+TAU or TAU. LRP met lifetime diagnosis for substance abuse or dependence and were 6 months abstinent from drugs and alcohol. ERP met current diagnosis for substance abuse or dependence and were actively using substances. For participants randomized to MAP, for each of the two cohorts, a pool of 4-5 mentors were formed and engaged in mentoring activities for 24 weeks until 12-13 Mentees who were newly admitted participated in MAP for 12 weeks. Behavioral assessments and biological objective substance use measures were conducted at baseline, weekly, monthly, and termination of the study for all participants and during the 12 week follow-up for ERP. This paper focused on data pertaining to the 48 ERP. Beyond reduction of substance use described in the main paper, significant improvements in psychiatric symptoms, quality of life, and global clinical functioning occurred for ERP in MAP. In conclusion, MAP shows promise in assisting in the reduction of psychiatric symptoms and overall improvements of quality of life and clinical functioning. The use of social support as a means of treatment continues to garner momentum within the mental health community [1-2]. Social support is based upon the idea that one can gain support from others within their social network with the goal of promoting self-efficacy, coping skills, goal attainment, and enhancing their overall sense of well-being [3-5]. More specifically, peer support is a form of social support that involves a like-minded peer who engages in a relationship with another individual based on mutual understanding and personal experience with the condition targeted in treatment [1,4,6-8]. The shared experience helps to establish a nonjudgmental and understanding relationship, further enabling the individual receiving support to gain a deeper understanding of the condition and learn more effective coping skills [1,5,9]. In addition, the individuals gain a sense of belonging and community, whereas they otherwise are apt to feel isolated or stigmatized by others . Socially isolated adults are less likely to be receptive to change their addiction behavior . Peer support treatments have shown to be an effective and important resource in the treatment of substance use disorders [8,11]. These services have been beneficial in helping patients achieve a reduction and/or total abstinence from substances [12-14], as well as improving quality of life [15,16]. Impairment to quality of life is a common experience for patients with SUD upon entering treatment and is associated with increased psychiatric symptom severity . Quality of life encompasses general life satisfaction with everyday experiences and events including for example family, social, and employment as well as the importance they hold for the individual . Peer support interventions have also shown a positive effect in reducing psychiatric symptoms [18,19]. Within a systematic review to assess this effect, peer support treatments were associated with symptom reduction and an improvement in functioning for patients, ranging from domains of employment, hospitalizations, social activities, and attitudes about treatment . While the results were overall positive, the review noted limitations and a need for further research. Specifically, there is a need for randomized trials, as their sample was primarily qualitative. The shift to assess impact on psychiatric and associated symptoms in addition to substance use in research is important as psychiatric symptoms are highly prevalent within the population of patients diagnosed with substance use disorders [20-22]. A meta-analysis conducted found that the comorbidity of depression with alcohol use disorder ranged from 24.3% to 48.5% . Clinical samples have an even higher co-occurrence, ranging from 50-70% . This is higher than in the general population, which has a 20.8% prevalence of mood disorders . Due to this elevated prevalence, the treatment for these patients needs to promote sobriety while working to decrease psychiatric symptoms to create a holistic sense of well-being. Current literature highlights the effect of substance withdrawal on psychiatric symptoms. During periods of withdrawal, patients are likely to experience an increase in their psychiatric symptoms and a decrease in global functioning [23,25,26]. This makes the onset of treatment a particularly important time. As patients are likely to be suffering from effects of withdrawal and increased psychiatric symptoms upon first entry into treatment, the first 30 days of treatment through two months are crucial as researchers have found that the rate of relapse is at its highest during this timeframe [27-30]. Furthermore, psychiatric symptoms can impede the treatment process and outcome [21-23]. A meta-analysis found that patients with depressive symptoms and a co-occurrence of Alcohol Dependence had an overall poorer prognosis . Findings also show these participants were overall less motivated, less compliant, and displayed a higher craving for alcohol than non-depressed counterparts, as well as a higher and more rapid rate of relapse [21,23]. During initial treatment, there is an increased need for efficacious and supportive treatments for patients as this represents a difficult lifestyle transition [23,26]. Peer-support treatments that place emphasis on the first 30 days are needed where there is an increased vulnerability for patients with Substance Use Disorders who also may suffer from increased psychiatric symptoms. The present study is the first, to our knowledge, aimed at directly addressing the need for interventions targeting initial stages of treatment in order to reduce psychiatric symptom severity and improve participant functioning. First through Mentorship for Alcohol Problems (MAP), a Stage Ia alcohol study conducted during the onset of treatment , followed by the current Stage Ib study, Mentorship for Addiction Problems (MAP),which more closely focused on initial treatment with an expansion to include broader substance using populations while assessing the impact on psychiatric and associated symptoms. Our initial uncontrolled Stage Ia National Institute on Alcohol Abuse and Alcoholism (NIAAA) funded treatment development project revealed not only promising findings, but the multiple substance using nature of the patient population in addition to the acceptability and feasibility of mentorship for MAP for the treatment of substance use disorders. Thus, we received National Institutes of Health (NIH)/National Institute on Drug Abuse (NIDA) funding within this project to conduct a Stage Ib randomized controlled pilot study to evaluate the efficacy of this approach with individuals who abused a broader group of substances. MAP is a new behavioral treatment that formalizes client-to-client mentorship relationships as an adjunct to standard outpatient substance abuse treatment. It is comprised of selection, training, and supervision procedures to enable successful recovering patients to serve as mentors for clients who are early in the recovery process. MAP mentorship is conceived as an optional module that can be incorporated into professionally run treatment programs based on a wide range of treatment philosophies. Mentees are assigned a mentor upon admission to outpatient substance abuse treatment for 12 weeks. Mentoring activities revolve around assisting mentees in progressing toward individualized treatment goals during 1 hour group mentoring and 1-4 hours of interaction within and outside of the treatment setting per week starting during the first 30 days of treatment when vulnerability to relapse and drop out is high. Mentors underwent mentor training consisting of 1 hour training sessions 2 times per week for 4 weeks prior to mentoring in addition to providing the individual and group mentorship contact to multiple mentees during their 24 week term. The following are the topics covered in the 4 week mentor training period: 1) Overview of MAP, 2) Understanding policy and procedures (e.g., interacting with system), 3) Your role as a Mentor (e.g., boundaries), 4) Helping your mentee maintain sobriety/modified GAS, 5) Maintaining your own sobriety in the process, 6) What to do in a Crisis (e.g., suicidal ideation, homicidal ideation), 7) mental health issues, 8)HIV/infectious disease (ID) risk reduction and 9) Being sensitive to diversity.. Supervision is provided by a professional staff member on an ongoing basis during weekly 1 hour mentor group supervision and ad hoc if needed. Later Recovery Participants (LRP) and Early Recovery Participants (ERP) with substance use disorders were randomly assigned using an urn randomization program to either MAP plus Treatment as Usual (TAU) or TAU alone. LRP met the Structured Clinical Interview for DSM-IV-TR Axis I Disorders (SCID-I/P) lifetime diagnosis for substance abuse or dependence and were 6 months abstinent from drugs and alcohol . ERP met current SCID-I/P diagnosis for substance abuse or dependence and were actively using substances. There were two cohorts. For participants in the MAP condition, within each cohort, a pool of 4-5 LRP mentors engaged in mentoring activities for 24 weeks until 12-13 recently admitted (within the last 30 days) ERP mentees participated in MAP for 12 weeks. Mentoring activities included weekly contact such as phone calls or meeting in the community/hospital (e.g., getting coffee, sitting in common areas, eating lunch together) to discuss goals, coping skills, and general life experiences. Behavioral and biological measures were conducted at baseline, weekly, monthly, and termination of the study for all participants as well as during the ERP 12 week follow-up phase. Included in the scope of this paper are the results from the Addiction Severity Index (ASI-Lite) Psychiatric Section, Quality of Life Inventory (QOLI), Substance Clinical Global Impression Scale (SCGI), and General Self Efficacy Scale (GSE). MAP’s positive impact on substance use will be reported in the forthcoming main paper for the study. The ASI  is a standardized, multidimensional, semi-structured, comprehensive clinical interview that provides clinical information important for formulating treatment plans as well as problem severity profiles in six domains commonly affected in substance abuse: Chemical abuse (drug and alcohol), medical, psychiatric, legal, family/social, and employment/support. ASI composite scores were calculated using scoring methodology for psychiatric symptom severity; scores ranged from 0-1, with higher scores indicating greater severity . Internal consistency reliability for the ASI for psychiatric symptom severity in this sample, measured using Cronbach’s alpha, was excellent (standardized alpha=0.81). The Substances Clinical Global Impressions-Self (SCGI-S) scale was adapted from the CGI for use in multi-center substance abuse clinical trials and evaluates areas of reported use, substance seeking behavior, psychiatric symptoms, physical/medical problems, and maladaptive coping. Each item is rated for overall severity ranging from 1 (no symptoms) to 7 (among the most extreme symptoms) and totaled with higher scores indicating greater severity of substance abuse. The SCGI has been found to be a reliable and valid measure of global functioning, correlates with actual use/related functioning problems, and provides a time efficient outcome measure for short term trials . The internal consistency reliability for the SCGI-S in this sample was excellent (standardized alpha=0.90). The General Self-Efficacy Scale (GSE) is a psychometric scale assessing for self-efficacy, which is the optimistic beliefs about coping skills and ability to deal with life challenges . The scale consists of 10 items ranked on a 4-point Likert scale ranging from 0 (not at all) to 4 (exactly true). We utilized this scale as one form of assessment of participants’ belief in ability to change circumstances to see if there were any differences in groups that may contribute to their belief in their ability to change substance use. Reliability for the GSE has been tested in 23 countries, with Cronbach’s alphas ranging from 0.76 to 0.90 . In this sample, the internal consistency reliability of the GSE was also excellent (standardized alpha=0.90). Mean scores for all instruments were compared between treatment arms across study weeks using linear mixed models. Statistical significance was indicated where p<0.05. All analyses were conducted using SAS Version 9.3 . Data utilized in the analyses and presented are on the 48 ERP, Mentees who were in MAP and received mentorship compared to counterparts within the control condition. There are two additional forthcoming papers that discuss the positive impact on LRP participants and the main substance use outcomes for the study. Seventy-five patients were approached to participate in the MAP program and 65(87%) signed informed consent. Of the patients excluded from the study 5(7%) were lost to follow-up, 2(3%) did not meet the required length of time of sobriety, 2(3%) had conflicting medical conditions and 1(1%) displayed historic episodes of violence. Of the 65 participants, 17 were LRP candidates for mentors and 48 were ERP candidates for Mentees. The 48 ERP was the sample this paper is based upon. There were no significant differences between conditions on common demographic variables Table 1. The age of participants (n=48) ranged from 21-69 years with the mean age being 45.6 years, SD=13.3. 35(73%) were males. 13(27%) were White, 13(27%) Hispanic, 16(33%) Black, and 6(13%) other non-Hispanic. For Substance Use and Psychiatric Disorders: 40(83%) had an Alcohol, Cannabis, 27(56%); Opioid, 12(25%); or Cocaine, 21(44%) Substance Use Disorder with 17(36%) having a co-occurring mood disorder and 16(34%) having a co-occurring anxiety disorder. 19(40%) were homeless. There were no significant differences for psychiatric ASI composite Scores between the two conditions at baseline. 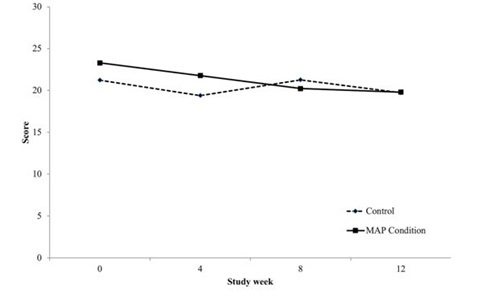 There was a significant difference in how scores changed across the entire study period weeks 0-24 (p=0.031), with scores decreasing steadily for MAP intervention ERP and increasing for control ERP particularly during follow up weeks 13-24, on average. Beyond substance use ASI composite scores, which were reported in the main paper resulting from the study which is in the process of being published, there were no other significant differences found in other non-substance ASI composite scores Figure 1. There were no significant differences for total QOLI Scores between the two conditions at baseline. 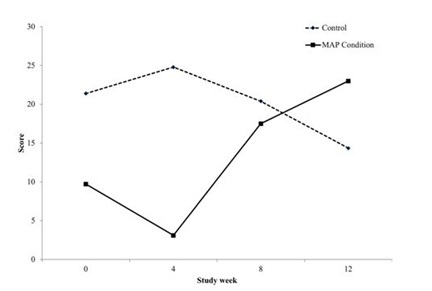 On average, during active treatment weeks 0-12, total QOLI scores significantly increased for MAP intervention ERP, but decreased for control ERP (p=0.029). There were no significant differences found during follow-up weeks 13-24 Figure 2. There were no significant differences for total SCGI Scores between the two conditions at baseline. On average, total SCGI scores decreased steadily for ERP in the MAP invention condition, but fluctuated in the control condition during active treatment weeks 0-12 (p=0.047). 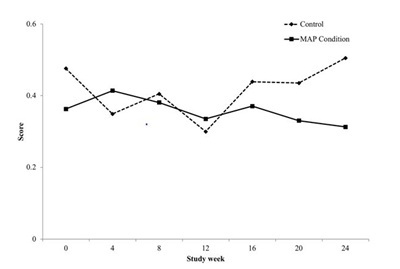 Although scores were lower among MAP intervention ERP compared to control ERP during the follow-up weeks 13-24 on average, there were no significant differences found during this period (Figure 3). There was no significant difference for total GSE scores between the two conditions across the study period weeks 0-24 (p=0.107). There was also no significant different between conditions in how GSE scores changed across the study period (p=0.809). The shift for greater attention in critically assessing the impact of peer supportive treatments on psychiatric and associated symptoms in addition to substance use within addiction research is crucial as psychiatric symptoms are highly prevalent within this population and may impact outcome. This is even more important during the initial phases of treatment due to withdrawal and associated high risk for relapse. While some data exists, in a recent meta-analysis, limitations on these data have been noted highlighting the need for randomized controlled studies. Early in treatment when individuals may be struggling with psychiatric symptoms associated with withdrawal, having a treatment that could help with better management of these symptoms can potentially improve outcomes and increase likelihood of initial and sustained abstinence. In addition, individuals who have co-occurring psychiatric conditions can also benefit and potentially achieve improved substance use disorder outcomes with treatments that positively impact psychiatric symptoms. As a result, there is a need to develop treatments that not only target reduction of substance use, but also better manage psychiatric and associated symptoms. Mentorship for Addiction Problems (MAP), a new peer to peer supportive treatment which targets providing support during the initial phases of treatment, was associated with improved psychiatric and associated symptoms. Psychiatric ASI composite scores steadily decreased for participants in the MAP intervention across the entire study participation both within active treatment and during follow-up while they increased for those participants in standard treatment alone. During the active phase of the intervention, overall severity of functioning improvement was associated with involvement in MAP. Total clinical global impression severity ratings, which consider not only substance, but psychiatric and associated symptoms in overall ratings, decreased steadily for those participants in the MAP intervention during the active treatment phase, but fluctuated for those in treatment as usual alone. Although substance use has multiple negative effects on the individual using, there are also immediately reinforcing effects of physical sensation or engagement within a social structure. When an individual stops using they are void of this reinforcement to feel a sense of pleasure. In addition, often they have burnt the bridges with non-substance based relationships that may have been relied on in the past for pleasure, so they have lost social connection outside of using based relationships. Therefore, it is critical to develop treatments that also create natural reinforcements within the individual’s life. For example, the mentoring activities are instrumental in creating a space for social and fun experiences that do not include substance use. During active treatment, quality of life significantly increased for those within MAP, but decreased for those in treatment as usual alone. These quality of life improvements shown in MAP may be associated with improvements in psychiatric symptoms. Impairment to quality of life has been found to be a common experience for patients with SUD upon entering treatment and has been shown to be associated with increased psychiatric symptom severity . Future studies further investigating this relationship are warranted. In further attempts to understand our results, we chose to measure self-efficacy to begin to examine the participant’s confidence in their ability to succeed in making change happen in their life, which may contribute to the participant’s overall ability to manage changes in substance use. Confidence in ability to change substance use behavior has been noted as an important outcome to assess addiction interventions . There were no significant differences between our treatment groups. It should be noted that this is a Stage Ib study. Similar to other Stage I studies, there are limitations due to sample size, which may impact ability to detect statistically significant differences between groups. Additionally, the number of patients with opioid abuse, in particular, is relatively small (22%) and the effects of MAP on people with addiction who are on replacement therapy, such as buprenorphine is unknown . However, beyond reduction of substance use discussed in the main paper, even with these limitations, MAP shows much promise in improving management of psychiatric and associated symptoms among those early in substance use disorder treatment. In addition, it may offer a foundation to begin to develop other areas of one’s life to offer a valuable competing reinforcement to substance use. We would like to thank the patients and staff at Bellevue Hospital Center who participated in the running of this project. In addition, we would also like to thank the National Institute on Drug Abuse (NIDA) and the National Institute on Alcohol Abuse and Alcoholism (NIAAA) as without their support through the following grants R34DA034898 and R01AA016160 respectively, this work would not have been possible. Tracy K, Wallace SP (2016) Benefits of peer support groups in the treatment of addiction. Subst Abuse Rehabil 7: 143-154. Swarbrick M, Tunner TP, Miller DW, Werner P, Tiegreen WW (2016) Promoting health and wellness through peer-delivered services: Three innovative state examples. Psychiatr Rehabil J 39: 204-210.
van Der Horst M, Coffé H (2011) How friendship network characteristics influence subjective well-being. Soc Indic Res 107: 509-529. Resnick SG, Rosenheck RA (2008) Integrating peer-provided services: A quasi-experimental study of recovery orientation, confidence, and empowerment. Psychiatr Serv 59: 1307-1314. Lee HJ, Szinovacz ME (2016) Positive, negative, and ambivalent interactions with family and friends: associations with well-being. J Marriage Fam 78: 660-679. Davidson L, Chinman M, Sells D, Rowe M (2006) Peer support among adults with serious mental illness: A report from the field. Schizophr Bull 32: 443-450. Dickerson F, Savage CL, Schweinfurth LA, Goldberg RW, Bennett M, et al. (2016) The experience of peer mentors in an intervention to promote smoking cessation in persons with psychiatric illness. Community Ment Health J 52: 416-423. Rowe M, Bellamy C, Baranoski M, Wieland M, O’connell MJ, et al. (2007) A peer-support, group intervention to reduce substance use and criminality among persons with severe mental illness. Psychiatr Serv 58: 955-961. Davidson L, Chinman M, Kloos B, Weingarten R, Stayner D, et al. (1999) Peer support among individuals with severe mental illness: A review of the evidence. Clin Psychol 6: 165-187. Zhang MWB,Tran BX, Nguyen HLT, Le HT, Long NH, et al. (2017) Using online respondent driven sampling for Vietnamese youths’ alcohol use and associated risk factors. Health Inform Res 23: 109-118. Bassuk EL, Hanson J, Greene RN, Richard M, Laudet A (2016) Peer-delivered recovery support services for addictions in the United States: A systematic review. J Subst Abuse Treat 63: 1-9. Dobkin PL, De CM, Paraherakis A, Gill K (2002) The role of functional social support in treatment retention and outcomes among outpatient adult substance abusers. Addiction 97: 347-356. Tracy K, Burton M, Miescher A, Galanter M, Babuscio T, et al. (2011) Mentorship for Alcohol Problems (MAP): A peer to peer modular intervention for outpatients. Alcohol 47: 42-47. Havassy BE, Hall SM, Wasserman DA (1991) Social support and relapse: Commonalities among alcoholics, opiate users, and cigarette smokers. Addict Behav 16: 235-246. Pasareanu AR, Opsal A, Vederhus JK, Kristensen O, Clausen T (2015) Quality of life improved following in-patient substance use disorder treatment. Health Qual Life Outcomes 13:35. Donovan D, Mattson ME, Cisler RA, Longbaugh R, Zweben A (2005) Quality of life as an outcome measure in alcoholism treatment research. J Stud Alcohol Suppl 15: 119-139. Frisch B, Clark MP, Rouse SV, Rudd MD, Paweleck JK, et al. (2005) Predictive and treatment validity of life satisfaction and the quality of life inventory. Assessment 12: 66-78. Chinman M, George P, Dougherty RH, Daniels AS, Ghose SS, et al. (2014) Peer support services for individuals with serious mental illnesses: Assessing the evidence. Psychiatr Serv 65: 429-441. Vally Z, Abrahams L (2016) The effectiveness of peer-delivered services in the management of mental health conditions: A meta-analysis of studies from low- and middle-income countries. Int J Adv Couns 38: 330-344. Grant BF, Stinson FS, Dawson DA, Chou SP, Dufour MC, et al. (2004) Prevalence and co-occurrence of substance use disorders and independent mood and anxiety disorders: Results from the national epidemiologic survey on alcohol and related conditions. Arch Gen Psychiatry 61: 807-816. Lejoyeux M, Lehert P (2011) Alcohol-use disorders and depression: Results from individual patient data meta-analysis of the acamprosate-controlled studies. Alcohol Alcohol 46: 61-67. Hides L, Samet S, Lubman DI (2010) Cognitive Behaviour Therapy (CBT) for the treatment of co-occurring depression and substance use: Current evidence and directions for future research. Drug Alcohol Rev 29: 508-517. Conner KR, Pinquart M, Gamble SA (2009) Meta-analysis of depression and substance use among individuals with alcohol use disorders. J Subst Abuse Treat 37: 127-137. Kessler RC, Berglund P, Demler O, Jin R, Merikangas KR, et al. (2005) Lifetime prevalence of age-of-onset distributions of DSM-IV disorders in the national comorbidity survey replication. Arch Gen Psychiatry 62: 593-602. Shu JE, Lin A, Chang G (2015) Alcohol withdrawal treatment in the medically hospitalized patient: A pilot study assessing predictors for medical or psychiatric complications. Psychosomatics 56: 547-555. Conner KR, Pinquart M, Holbrook AP (2008) Meta-analysis of depression and substance use and impairment among cocaine users. Drug Alcohol Depend 98: 13-23. Maisto SA, Pollock NK, Cornelius JR, Lynch KG, Martin CS (2003) Alcohol relapse as a function of relapse definition in a clinical sample of adolescents. Addict Behav 28: 449-459. Cornelius JR, Maisto SA, Pollock NK, Martin CS, Salloum IM, et al. (2003) Rapid relapse generally follows treatment for substance use disorders among adolescents. Addict Behav 28: 381-386. Ramo DE, Brown SA (2008) Classes of substance abuse relapse situations: A comparison of adolescents and adults. Psychol Addict Behav 22: 372-379. Ouimette P, Coolhart D, Funderburk JS, Wade M, Brown P J (2007) Precipitants of first substance use in recently abstinent substance use disorder patients with PTSD. Addict Behav 32: 1719-1727. First MB, Spitzer RL, Gibbon M, Williams JBW (2002) Structured clinical interview for DSM-IV-TR axis I disorders, research version, Patient Edition (SCID-I/P). Biometrics Research, New York, USA. Mclellan AT, Luborsky L, Cacciola J, Griffith J, Evans F, et al. (1985) New data from the addiction severity index. Reliability and validity in three centers. J Nerv Ment Dis 173: 412-423. McGahan P, Griffith J, McLellan AT (1986) Composite scores from the addiction severity index: Manual and computer software. Veterans Administration Press1992:142-153. Lehman AF, Ward NC, Linn LS (1982) Chronic mental patients: The quality of life issue. Am J Psychiatry 139: 1271-1276. Tracy K, Baker S, LoCastro J, Mezinskis J, Simon S, et al. (1999) The Substance Clinical Global Impression (SCGI) scale: Measuring global functioning in substance related clinical trials. Problems Drug Depend 180: 169. Schwarzer R, Jerusalem M (1995) Generalized Self-Efficacy scale. In: Weinman J, Wright S, Johnston M (eds.). Measures in health psychology: A user’s portfolio. Causal and control beliefs 35-37. SAS Institute Inc (2011) Base SAS® 9.3. Procedures guide: Statistical procedures. SAS Institute Inc, North Carolina, USA. Zhang MW, Fang P, Ho RC (2016) Global outreach and user preferences of a smartphone application developed for drinkers. Technol Health Care 24: 495-501. Ho RCM, Chen KY, Broekman B, Mak A (2009) Buprenorphine prescription, misuse and service provision: A global perspective. Adv Psychiatric Treat 15: 354- 363. Figure 1: Addiction Severity Index (ASI) composite score for psychiatric symptom severity by treatment arm among ERP during active treatment and follow-up. Figure 2: Quality of life inventory (QOLI) score by treatment arm among ERP during active treatment. Figure 3: Substance Clinical Global Impression Scale-Self (SCGI- S) score by treatment arm among ERP during active treatment. Table 1: Baseline characteristics of ERP compared across conditions. Note: MAP=Mentorship for Alcohol Problems. SD=Standard Deviation. Values are represented as N (%). *P-value associated with chi-square test or Fisher Exact test for all variables but age and days of drug or alcohol use (t-test for difference in means). **Does not add to 100% because groups are not mutually exclusive. Citation: Tracy K, Wachtel L, Goldmann E (2018) Beyond Substance Use Reduction: The Positive Impact of Mentorship for Addiction Problems (MAP). J Alcohol Drug Depend Subst Abus 4: 009.